Step 1: Thread your needle with about 2 feet of FireLine. Leaving about a 5-inch tail that you can weave in and make disappear at any time, string two seed beads and three 3mm beads. Step 4: String two seed beads. 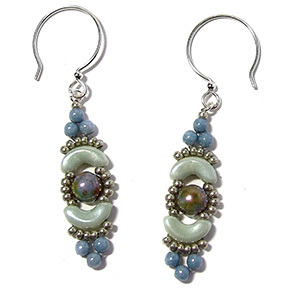 NOTE: Although Arcos beads have three holes, you’ll only be using the two outside holes for this design. Just ignore the middle hole. 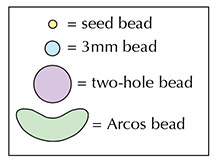 Step 5: String a seed bead and go up through the right hole of a two-hole bead. Step 6: String six seed beads. Step 7: String a seed bead. Step 8: String a seed bead. Step 12: String three seed beads. 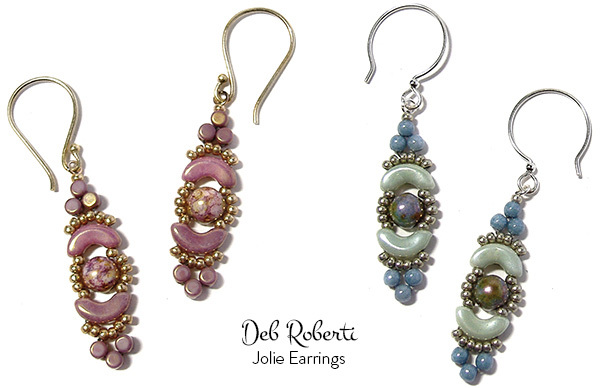 NOTE: Unfortunately, not all size 11/0 seed beads are actually the same size. If three seed beads doesn’t seem like enough to wrap around the two-hole bead in Step 12 and 14, just add four seed beads instead. Step 15: String two 3mm beads and a seed bead. Step 16: String another 3mm bead. 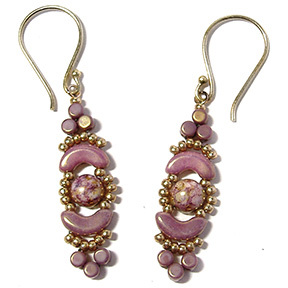 Weave back into your earring, knot and cut your thread. Attach your earring finding to the jump ring.